The subject is up for much discussion: SEO friendly URLs. Should or shouldn’t I include the category? Should the URL be as short as possible or is there room for extra’s? Should it be stuffed with keywords or not? 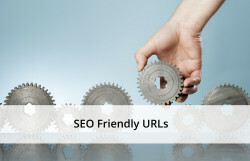 In this post, I’ll explain our take on SEO friendly URLs and try to elaborate a bit on why we think that is the best option for that link. First, let me tell you that a SEO friendly URL differs per type of website. In this article, I’ll discuss a few to show the differences. There are a few ground rules, but I strongly encourage you to keep the visitor in mind when setting up your URL structure. This snippet also shows that length isn’t that much of an issue: Google will show what they think is important for that visitor. Keep in mind that meta titles and descriptions are cut off at 512 pixels, and so is your URL – as you can see above. Don’t use underscores, as these connect the words and make them into one. Dashes are preferred. If your site as a whole has a strong coherence, you could consider focusing on the post title and the post title only to create an SEO friendly URL. The coherence will indicate the main topic of your website to Google, so no need to add that in the URL. If your website is a news website and you’re writing about different topics, adding the topic (for instance as a category name), will make even more clear what the page is about. It’s a bit similar as explained above at SEO friendly URLs for your webshop. If your website features daily news and the news is related to a date, be sure to include that date in the URL as well. If someone is looking for the latest news on Apple’s products, the date in the URL will already show if the page is about this year’s iPhone or not. My recommendation: only use the date in the URL if the date matters. There is no one way to create the best SEO friendly URL. It depends on the type of website you have. Especially with a blog or news site, there are multiple options. The main thing is to keep your URLs focused. Besides that, make sure to include all information that’s important to make clear what the page is about. Any questions can be dropped in the comments below. This post first appeared as SEO friendly URLs on Yoast. Whoopity Doo!